Parfum d'Empire, for those who are not familiar with the line, creates fragrances inspired by historical empires. They've covered quite a bit of ground already, having taken us to Tsarist Russia (Ambre Russe), the Ottoman Empire (Cuir Ottoman) and the Napoleanic Empire (Eau de Gloire), among others. The perfumes are lovely — Ambre Russe particularly so — but none of them have explored themes likely to capture my heart entirely, and so up until now, I've admired the line in an abstract sort of way. Osmanthus Interdite, on paper, looked like the kind of thing that might finally win me over: it takes the Chinese empire, past and present, as its inspiration, and the fruity floral scent features notes of green tea, citrus, osmanthus, rose, jasmine, musk and leather. Lee over at Perfume Posse told me he would eat his hat (well, strictly speaking, he said he'd eat his hat if he had one) if I didn't like it, and I must apologize (again) for my predictability, but his "hat" is perfectly safe. Osmanthus Interdite opens on fruity, mildly sweet citrus and just the softest touch of tea. The scent plays up the apricot-ish undertones of the osmanthus, which blends beautifully with the other floral notes in the heart. The leather is as buttery-soft as leather can possibly be while still smelling like leather. As Lee has already pointed out, Osmanthus Interdite has much in common with another China-inspired pairing of tea and osmanthus, Osmanthe Yunnan by Hermès. But Osmanthe Yunnan's sharp opening and smoky-dry finish are absent in Osmanthus Interdite, which is a fuller, rounder, more feminine take on the subject, something like what you'd get if you crossed Osmanthe Yunnan with Ormonde Jayne's Osmanthus. The dry down is simply lovely. I don't know what it is about some osmanthus scents that makes me so happy, but I've long depended on the Ormonde Jayne as a kind of antidote to S.A.D., and Osmanthus Interdite will now join the arsenal — it brings a smile to my face right away. Along with Osmanthus Interdite, we have two other new entries from Parfum d'Empire: Equistrius and Fougère Bengale. Equistrius is a tribute to both the Roman Empire and a racehorse owned by Marc Antoine Corticchiato, the founder of Parfum d'Empire. It's a lovely blend of powdery iris, musky woods and the slightest little hint of chocolate (nothing like the much sweeter and heavier Iris Ganache from Guerlain). I've said many times that there can't be too many variations on iris, but the recent avalanche of niche iris scents might have me temporarily iris-ed out. I like Equistrius but couldn't get worked up about it, so I'm setting it aside for a few months to see if it grows on me. Fougère Bengale, meant to evoke India under Queen Victoria, puzzled me — I checked the label and the notes several times to make sure that it wasn't the one inspired by the racehorse. Nope, this is Fougère Bengale and India. But it's all there: the horse, the hay, the barnyard, the manure, even the tobacco drying in the eaves of the barn. It is way cool, and probably the most interesting of the trio, but not something I'd wear. I'm going to send it off to Kevin and see if he can do it justice. 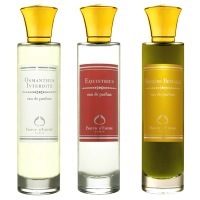 Parfum d'Empire Osmanthus Interdite, Equistrius & Fougère Bengale are in Eau de Parfum, and are $135 each for 100 ml. It goes without saying that the trio ought to be available in a coffret of 15 ml bottles, doesn't it? But no such thing exists. For buying information, see the listing for Parfum d'Empire under Perfume Houses. I have samples on the way, oh joy! The one I'm expecting most from is Equistrius…but it seems to be second favourite for both you and Lee, so presumably not the blockbuster iris of my imagination? Cuir Ottoman was my greatest discovery of last year – I never thought I could fall so heavily for a leather scent. The whole line pleases me. And I especially love the bottles. You know what's funny – I think Equistrius is a slowburn fragrance, and like Robin says, disadvantaged by the plethora of other iris dominant fragrances out there. It actually reminds me more and more of Divine's L'homme de coeur – in style, if not always content, but has much greater tenacity. Alas, my sample has long since left me for foreign shores (wave to Patty) but I might get a bottle when I'm finally out of the Divine. R – you're right – FB is the weird one. I love it. I can't yet get my hands on a bottle and the itch is getting unbearable. Will be very curious to hear if the iris blows anyone away…it really is nice, just not mind-blowing, maybe? Or maybe I really am iris-ed out? Not sure, which is why I need to set it aside for a time. Cuir Ottoman is a great scent, really, I was very impressed. It just isn't me. Might actually be a more interesting/unusual use of iris than Equistrius. Will have to try it next to the Divine then — I do love that one. Luckyscent is already doing pre-orders, and I know Beautyhabit will have it soon too, and I'd guess Aedes & everybody else who carries the line. REALLY wish they'd done smaller sizes! So happy to see a review from you of these so early – I was just contemplating getting the long-coveted sample set. That Fougere Bengale is just sounding better and better to me all the time. The Osmanthus sounds nice, but I don't think for me that it will dethrone my darling OY. And what *is* with all the irises lately? You need a sample set at the very least! FB is going to have its own little cult following, I'd guess. The osmanthus is pretty darned different in feel from OY, despite the very similar notes — it doesn't have that crisp, summery feel at all. Much closer in character to the OJ — rich but exuberant. The iris is out of control, seriously! And I do love iris. Maybe there is some new synthetic iris out there that inspired everybody? No idea. K, do go and read Lee's review if you haven't already — it really sounds way more like you than me! Hmmmm. . . I had thought that Equistrius would be the one I would like, but the FB sounds much more interesting. And I wouldn't turn down something that can banish SAD. Must get samples. . . .
Maybe Equistrius *will* be the one you'll like — it really is nice. I just don't adore it. And it's too bad it's the 2nd iris w/ chocolate this year, because they're bound to get compared w/ each other. I see they're out at Beautyhabit and Luckyscent ($25 price difference), but neither Les Senteurs or First in Fragrance have them yet…. Ah, thanks, didn't know they were at BH yet. And was hoping for a huge price difference — $5 out of $130 I can't get excited about! What I want is a 15 ml bottle (all I need of *anything*) for no more than $30. HA! Oops…just saw that you said $25 price difference. I'm seeing them at BH for $130 and LS for $135? Ah, gotcha. Wow, are those things at LS 10 ml? I missed that entirely. Yep, I need those!